She was more gracious than I expected. And kind. She embraced me strongly as if her own force could encourage me to continue my efforts. It was a tremendous gift, a gift borne out of a choice I made several years ago. With the holiday season upon us, I want to encourage us to think about our choices and the gifts we receive as a result. The choices we make are not all the same. There are simple choices like what to get the kids for the holidays or which tradition will take center stage this year. There are more complex choices like how to prioritize the competing demands of the work I love. Gregory Gibson, a father who lost his son to random gun violence, was asked about choices in a recent WBUR interview. He made a distinction about choice that I found enormously helpful. Gibson said, “People sent teddy bears. Newtown had to rent storage space to accommodate the number of teddy bears.” Gibson was baffled by this collective choice. He couldn’t really believe that instead of votes and activism and outrage that people chose to send teddy bears, 65,000 of them. He was struggling to understand this choice, a choice he believed fell far short of our ability to create meaningful change. I like this story because I find myself choosing teddy bears a lot. Every day I make teddy bear-esque choices. What Gibson helped me see is that the choices we make have their own profile, their own potential for impact. What choices are you considering as we conclude ’17 and begin a bright new year? Way back in 2010 I made a choice to act on something that happened to me. One day the ground fell out from underneath me while I was on a business trip to London. It was a chance event. At the time it felt crushing and disorienting. I couldn’t describe it to anyone. I had no words to rely on that would convey the enormity of what was at play. All of a sudden the ways that I had used to make sense of the world lost their meaning. It was wrenching and frightening and incredibly lonely because no one around me could fathom why I would step away from all that I had labored to achieve. Something wasn’t right. I knew it. I had a choice to make. To see what might be there…. My choice demanded that I step forward into uncertainty. Not recklessly but with determination and an open heart. The steps ultimately led me to transition and its enormous gifts. Now many years later with two flights of research and a published book under my belt, I can now say with confidence that transition is really about choosing growth. Our own growth. My wish for you this holiday is that you will find a quiet moment in which to make your choices. And that you consider choices that have the potential to bring forward the unique gifts that you alone possess. I would never have told you that I didn’t know myself so many years ago in London. And yet the choices I’ve made since introduce me to myself in ways I never dreamed possible. Funny enough, I believe that these ways complete me like few other activities ever have. May peace and joy find you this season and may your choices bring you closer to the incredible gifts that you alone possess. Now, more than ever before, I believe that the world cannot survive without them. Warmest wishes for a safe and happy Holiday Season! 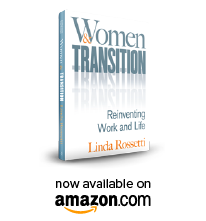 This entry was posted in Observations on Transition and tagged career change, career transition, divorce, empty nests, gloria steinem, job loss, linda rossetti, personal transition, retirement, work family balance. Bookmark the permalink. Wow – this a powerful year-end post. I must confess that I’ve already started a gift for you with this picture, which you will soon see. Good for you for being authentic and revealing who you are to your readers. I’m proud of you.